Applications: Custom RF Data Logger is suitable for Lyophilizers. Custom design real time data logger (wireless) for monitoring temperature during the freeze-drying process. Highly efficient (quick validation time), highly reliable (real time data), impressive accuracy (±0.1°C). Standard data logger for capturing humidity and temperature values. Covers all applications between 15% to 95% RH and -40°C to +85°C, high accuracy (±2% RH | ±0.1°C). It has high efficiency and it is user friendly, multiple users may simultaneously share the same database. The CAP-TT01 torque tester is used to measure cap removal torque for a wide variety of containers. 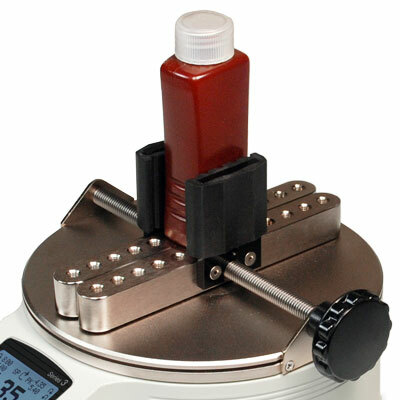 The Cap torqure tester is rated for 50 lbf-in. 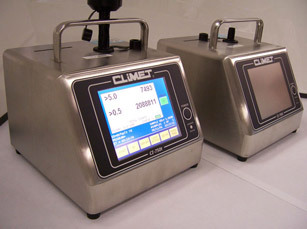 It has a sample rate if 7000 Hz and an accuracy of ±0.3% ensure precise and reliable data. Output torque can be measured in Oz-in, Lb-in, Lb-ft, N-m and N-cm. 1000 data points can be stored and read through USB, RS-232, Mitutoyo, and analog outputs. 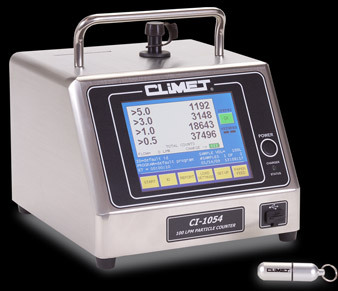 CLiMET® 1054 is laser particle counter, purposely designed to meet ISO 14644-1 requirements for ISO 3 through ISO 9 cleanroom environments. The straightforward control interface allows for ease of use, and the brushed-stainless steel exterior and laminated touch-screen LCD cover allows for thorough cleaning of surfaces before introduction into cleanrooms/clean zones. 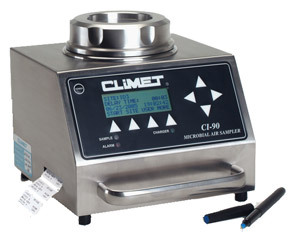 The CLiMET® 90 (CI-90) is a microbial air sampler. It can capture biological active particle such as fungi and bacteria onto a petri dish loaded with nutrient agar. The sample can be incubated to grow the captured microbes. The colonies formed after incubation are counted to determine the concentration of CFU’s (colony forming units) present in the air sample. Standard data logger for capturing temperature values. Covers all applications between -40°C to +85°C, high accuracy (±0.1°C). It has high efficiency and it is user friendly, multiple users may simultaneously share the same database. Standard data loggers for recording temperature values. Easy to program and install, no data loss during validation process, multiple users can share the same database simultaneously. Remote factory calibration on users site. Real time data logger designed to measure temperature inside vials. Highly efficient (quick validation time), highly reliable (real time data), impressive accuracy (±0.1°C).